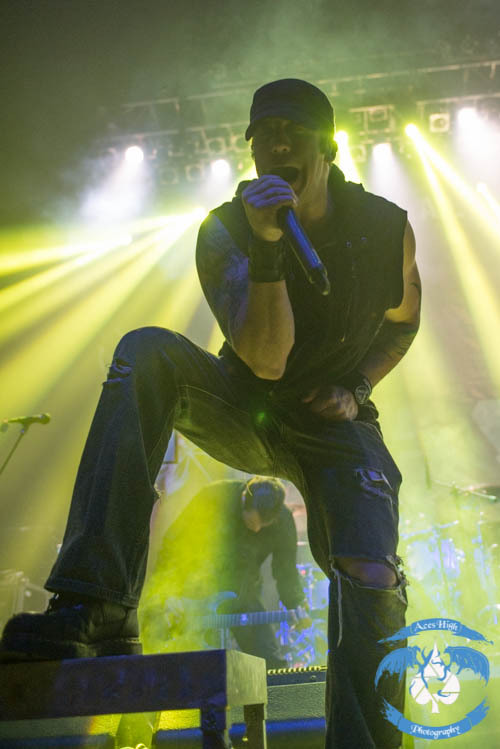 I arrived at the Agora Theater in Cleveland several hours before doors to meet up with Rob Caggiano of VOLBEAT for a quick interview which you can check out HERE. After the interview I was able to grab some grub at the backstage café adjacent to the venue and just hang until will call opened. While trying to pass the time I spoke to a few fans that had been in line since 10 am. The show had sold out way in advance so people started to line up super early to ensure their place at the barricade. As the line grew, I became increasingly aware that this show was going to get nuts. I couldn’t wait. Up first on the bill was DIGITAL SUMMER from Phoenix, Arizona. I knew very little about this band beforehand, but they really left an impression on me. From the intro forward, they performed with a charisma and energy that most headliners only have. Vocalist Kyle Winterstein was all over the stage, stirring up the crowd and newest member, 13-year-old Austin Rios set the tempo from behind the drum kit. Yes…you read that correctly, 13. The short set was highlighted by the single “Forget You” off of their 2012 release, Breaking Point. Once DIGITAL SUMMER wrapped up their set, it was time for TRIVIUM to make a mess of the theater. I was really impressed with TRIVIUM’s set. My linchpin has always been whether or not a band can go out and translate their work in the live setting. I had never seen TRIVIUM before so I was really wondering how tight they could be. I was blown away. Their set began with “Brave This Storm” off of their most recent release, Vengeance Falls. The drum kit was perched atop a huge riser complete with massive chrome TRIVIUM “T” logos flanking it on either side. The audience, which had been rather tame up to this point, started to get a little rowdy. Crowd surfers began to pour into the photo pit. 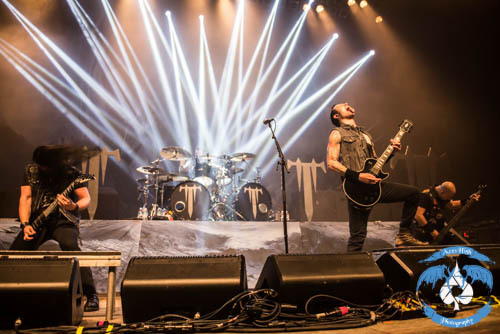 TRIVIUM burned through their ten song set that wrapped with the hit “In Waves”. The beer was flowing, the circle pit was going, and TRIVIUM pulled off their aggressive show without a hitch, like clockwork. Like I said, I was truly impressed with their performance and I will definitely check them out again in the future. After a short set change VOLBEAT was primed and ready to rock. The Danish quartet had brought with them their swinging, groovy, rockabilly-ish brand of rock n’ roll. The intro to “Doc Holliday” played as the band took the stage. 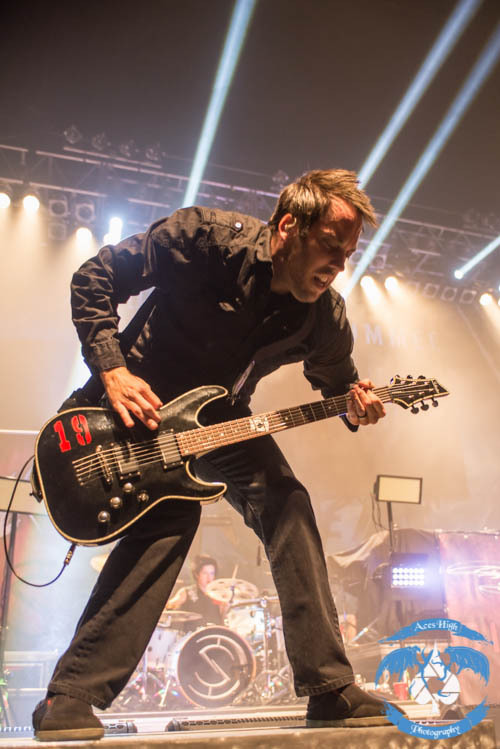 Vocalist and guitarist Michael Poulson has a certain persona about him. Like a 1950’s “greaser”, Michael would pull out a comb after every tune and slick back his hair. He was dressed for the part too with dress slacks, a big belt buckle, and dress shoes. His charisma and actions on stage seemed as though he was channeling his classic rock n’ roll idols, Elvis Presley and Johnny Cash. In fact, VOLBEAT did a shortened cover of “Ring Of Fire” and the crowd finished the verse. The setlist was enormous – nineteen songs which included a couple medleys and excluded a shortened cover of “Breaking The Law” by JUDAS PRIEST. 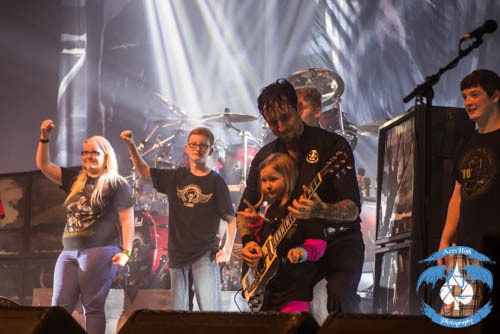 Newest edition, guitarist Rob Caggiano often stepped out in front of the monitors that lined the front of the stage to solo. I have seen Rob with ANTHRAX and now with VOLBEAT and the difference is night and day. He really looked like he was enjoying himself with VOLBEAT. I don’t ever remember him being so animated on stage with ANTHRAX. VOLBEAT ended their set with “Still Counting” before coming back for an encore. Michael Poulson spoke to the audience after “The Hangman’s Body Count” to explain that they had written their next song, “Thanks” as a tribute to their U.S. fans. He asked for all of the children in the audience to come up on stage with them for this song. Now, I am an opinionated father of two and I have seen some things at various concerts that I hope my kids will never see. I also can’t wait to introduce them to live music when the time is right. Some of the parents in attendance were brave enough to bring their children - I mean really little children to the show. The kids all lined up in front of the drum riser as VOLBEAT performed “Thanks”. Michael Poulson explained that this is the next generation of music fans and we must introduce them to rock n’ roll and metal in order to ensure its existence in the future. During his solo, Michael brought out one of the youngsters and put his guitar over her while he crouched down and played. Now I can say I have seen it all. Overall I was really pleased with VOLBEAT’s performance. The songs were tight, the energy was high, and the crowd was ravenous. It was an excellent night of rock and metal that went on without any noticeable hiccups (besides my friend breaking his leg in the pit – but that story is for another day). To be honest, I was a little skeptical about this lineup, but the energy and swagger on stage won me over and I left a fan. Check out some more photos of the show!